Big Walnut Heating & Cooling serves Marengo, Sunbury & Westerville, OH. 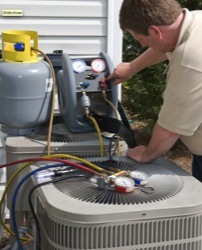 We provide heating and cooling services and products to the Greater Columbus area. Big Walnut Heating & Cooling is a local family owned and operated heating and cooling contractor serving the residential, commercial and industrial sectors. We offer quality service and repairs with competitive pricing. With over 12 years of industry experience, we continue to put quality customer service and superior craftsmanship at the forefront of our business. Our technicians are professionally trained, courteous and polite, people you can trust in your home or office. Big Walnut Heating & Cooling values our customers and respects their requirements. That's why we offer equipment priced at different levels for every budget. We offer a full line of equipment and accessories for all of your heating and cooling needs. Big Walnut Heating & Cooling will provide installation or service on all makes & models. Read about Tax Credit Information for HVAC products. We are proud to offer Comfortmaker air conditioning & heating products. Call 614.327.1310 or contact us online. Serving in and around Marengo, Sunbury, Westerville, Galena, Lewis Center, Powell, Marion, Columbus, Bucyrus & Mansfield, OH.